Responding to the call of President Xi Jinping in April at the Chinese Academy of Sciences, scientists now said they plan to set up a deep-sea defense and science base to be run entirely by artificial intelligence. IN 1997, the devaluation of the Thai baht marked the start of a crisis that decimated many Asian economies. Southeast Asia’s consumer economy will soon be transformed by the rise of the “mass affluent” as tens of millions from the middle class join their ranks, according to a new report by The Boston Consulting Group (BCG). he November edition of the Asian Development Bank’s local-bond publication, reviewing the August-October quarter in nine East Asian markets, cited higher yields, currency depreciation and reduced foreign holdings as likely trends into next year against the backdrop of emerging economy “risk aversion” and developed-world monetary-policy adjustment. Driving attitudes across the region has changed dramatically with the introduction of electric vehicles into the personal mobility market. LISTED companies in Singapore, Malaysia and Indonesia are less exposed to cyber threats, on average, than their global peers, a new study has found. Citizens of 11 Southeast Asian countries will be able to visit Korea more easily when Seoul’s new visa measures start next month, if they meet certain background conditions. Skype co-founder Geoffrey Prentice has raised $105 million in the first significant funding round for his latest venture, a microlending business in Southeast Asia, intensifying the battle for the region’s vast unbanked population. With the intensifying rivalry between the United States and the People’s Republic of China, Southeast Asian countries can no longer sit on the fence, and have a tough choice to make. Indonesia will keep the export tax for crude palm oil (CPO) at zero and the export levy for cocoa at 5 percent for December, Oke Nurwan, a senior official of the trade ministry, told reporters on Tuesday. Indonesian investigators will deliver their first report into the Lion Air crash on Wednesday, a month after the brand-new Boeing 737 crashed into the sea, killing all 189 on board in the country’s second-worst air disaster. Bank Indonesia (BI) Governor Perry Warjoyo announced on Tuesday the revision of its gross domestic product (GDP) projection for 2019 to between 5 and 5.4 percent from its initial projection of between 5.1 and 5.5 percent. Petroliam Nasional Berhad, or Petronas, today said it will increase its dividend payout to the government after its third-quarter net profit jumped on higher revenue and oil prices. The Malaysia Retail Chain Association (MRCA) expects retail sales to grow by 5 per cent in 2019 in line with nation’s gross domestic product (GDP) growth. Airbnb, an online marketplace for hospitality service, is in discussions with the relevant authorities and ministries to implement the voluntary collection agreement (VCA) to collect tourism tax. The vice chairman of China’s top economic planning agency has pushed Myanmar’s State Counselor to work out an implementation plan for the China-Myanmar Economic Corridor, a part of Beijing’s Belt and Road Initiative (BRI). 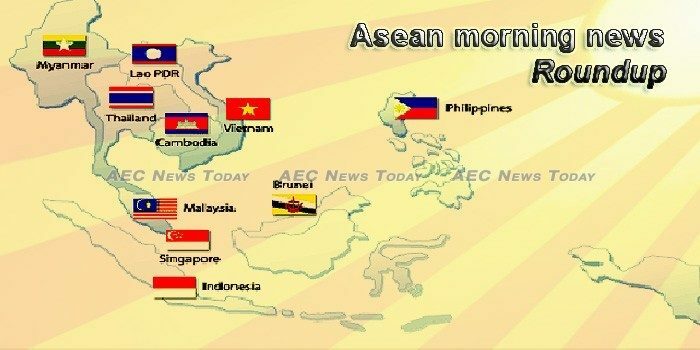 Myanmar’s expected integration with the ASEAN Economic Community (AEC) at the beginning of next year will translate into an upgrade in the regulatory environment, attracting further regional investments, a leading Singapore group said on the sidelines of a recent forum. The Philippines and China have set out a ten-year cooperation program on infrastructure that is hoped to outlive the term of President Rodrigo Duterte, according to a copy of an agreement between the countries released by the Palace on Tuesday. Over two years since President Rodrigo Duterte launched his campaign against illegal drugs on July 1, 2016, nearly 5,000 people have been killed, according to the Philippine Drug Enforcement Agency (PDEA). BEIJING is penciled to deliver over $8.37 billion of investments in industrial park development as part of its program for cooperation with Manila signed during Chinese President Xi Jinping’s state visit last week. The manufacturing production index in October was at 112.79, up 4.08% year-on-year and 1.55% from the previous month on automotive, cigarette, sugar, petroleum and air-conditioner production. Tourist arrivals to Thailand are reportedly up 20% in the latter half of November in response to the government’s visa-on-arrival (VOA) fee waivers, with India the star market. Vietnam plans to build a 115km expressway connecting northern Lang Son and Cao Bang provinces on the Chinese border to foster their development.